Ear mites are external parasites infecting cats and dogs The adult mite can live its entire life on the pet, enabling it to be highly contagious and can also cause severe inflammation Once cursed, pets seem to have the problem for life. The mites Otodectes cyanosis are large enough and easily visible to the naked eye. Ear mites as the names say lives in the ears as well as on the head and skin of the pets. In just 3 weeks, a mite egg can develop into an adult mite. Ear mites are highly contagious and readily transmit from host to host by physical contact. Your pet can get easily infected if it socializes with other infected animals. 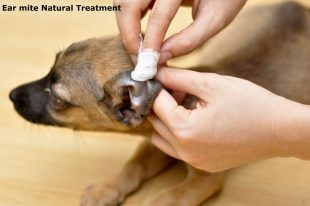 Treatment for ear mites is a must for all the household pets. Shaking of the head and ears is the most common sign of ear mite infection. Dogs scratch at their ears, rub their face and in severe cases, they may even bleed behind their ears to relieve themselves from the pesky little critters. Though some pets can still be infected and not show any signs of itching or head shaking. Ears that seem very itchy and have dark debris, down in the ear, are the telltale signs that your pet’s ears have visitors. Dark brown to black debris accumulates in the ears of infected pets and the mites may be visible as small moving white specks on the debris. Secondary infection with bacteria or yeast is common in ear mite infections and may complicate the diagnosis. Any natural oil-based ear medication will ultimately drown the mites as the oil covers the mite’s breathing pores eventually suffocating them. Keep your pet and its environment treated for fleas. This also kills any ear mites that might be around to re-infect your pet. To remove ear mites, mix ½ ounce of almond and vitamin E.
Put a dropper or two in each ear and massage it well. Let your pet shake its head and clean out the opening with cotton swabs. The oily mixture smothers the mites and helps to heal. Refrigerate the mixture between uses, warming it before use. Soak a cotton ball in mineral oil and swab the ear canal. The oil soothes skin, smothers the mites, and accelerates healing. Give your pet mild flea baths during the treatment period to squelch any wayward mites. The reader of this article should exercise all precautions while following instructions mentioned in the article. Avoid using if you are allergic to something. The responsibility lies with the reader, not the site, and the writer.